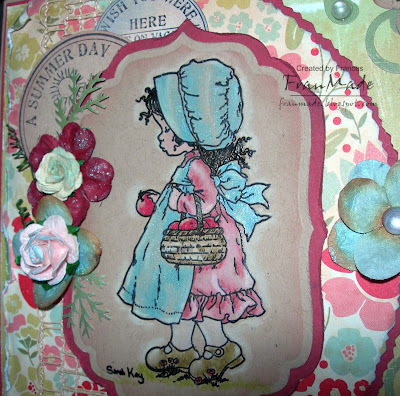 Since I've rediscovered my Sarah Kays again, I've been checking out the company blog (Stampavie) more (as I am loving all the new stamps they have coming out by new artists soon and am making my shopping lists LOL). Off to drool over some more new stash that landed today (got the CC designs limited Autumn kit and wow, do you get a lot! . .plus a few sheets of new Cosmo Cricket xmas paper may have flown over with it too :D). CCT this week wants you to get fruity. So I've gone for a quickie ;) and made this very simple card with a corny message to go with . . The melon is a magnolia stamp which I have masked and stamped twice. All the texts are rub -ons. Erhm, not much else to say about it really but I quite like it. 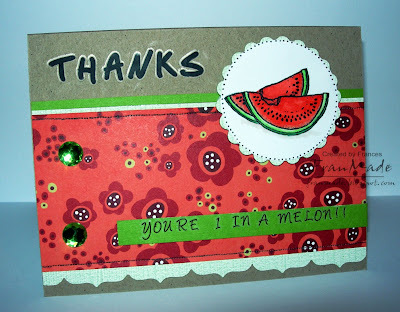 If you want more inspiration for fruity themes go check out the rest of the DT's creations over on CCT. I used just shades of grey Copics (W's & C's as that's all I have at present). It looked really odd at first as I started with her grey face and she looked really ill LOL, but I kept going till the end and then it all made sense! For a bit of shimmer I added twinkling H2O to her glasses, feather boa and her outfit. The little flourishes around her are from an Inkadinkado set. Then I just matted it onto grey and white card. Really simple but I love how it turned out. Will have to make a card in these colours sometime. Evening! What a dreary old day it's been here - where's our summer gone? If you have it, can you return it please as it feels like autumn already and I don't like it! Anyway, onto my card for today. It was supposed to be for Simon's Says challenge as I liked the sketch and thought it was about time I played along to one . . but looks like I'm too late! Luckily have been saved by Stamp with Fun who want to see pearls and I have those on there - yeah! My new Sarah Kay stamps finally arrived last week and I inked this one up first as I wanted to use my bargain MS birdie border punch - isn't it cute?! I originally had this on preorder with Hobbyhouse when it was first released but then their deliveries got held up so I cancelled and ordered something else. Then the other week I happened to be browsing - like you do! - and saw they had it on special offer for £10.49 (only for that weekend) so I had to get it - I was obviously meant to have it! Onto the award I got given this morning from Kathy, isn't it so cute?! I've 'known' Kathy since pretty much the start of my blogging life and just seemed to click with her - I adore her cards (her blog title is so apt - love how she distresses! ), we seem to have the same tastes in stamps and papers (although she probably has more of a paper habit than I do LOL) AND she liked my dodgy taste in music when I had the music player on my blog. So thanks Kathy, the feelings mutual!! Now I'm usually really bad when it comes to passing awards on but this award really means alot to me as it is only given to a single person and I was chosen so it's only fair that I play along. So for the tough bit. 1 - Forward this award to one person only. 4 - Mention rules when passing on this award. 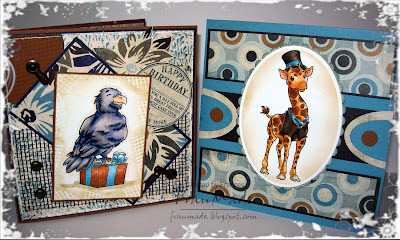 A couple more cards today using the new Alison Acton, 'party animals', release from Whiff of Joy. For some reason I looked at them and thought 'male cards' so went to my Basic Grey pads and thought colours in 'Granola' pad seemed to work with all of them. Then for my second card, I've gone for opposite style and kept it very clean and simple (it was so hard not to add more stuff to it! 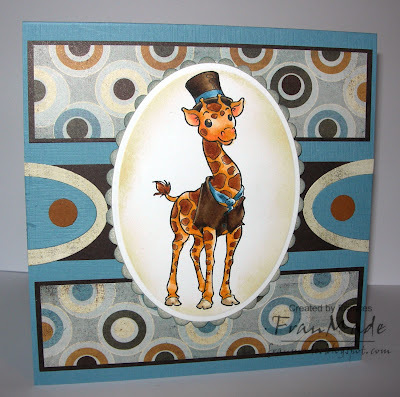 ), using 'Claude giraffe' (love his outfit!) and this fortnight's sketch & stash sketch. Left sentiment off until I come to use it or may just leave it off all together. 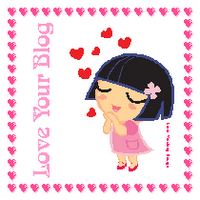 Wow, it must have been some party last night as I had so many blog hop visits!! Thank you so much for all the lovely comments and I hope you all had a good time - shame I missed it but I did have a little catch up and loved all the fab and varied creations on the hop, not to mention the sneek peeks of the upcoming christmas stamps (too cute!). 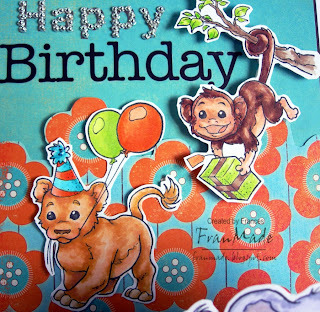 O.K without further ado the winner of my mini candy, (the cute monkey stamp and some papers) is . . .
Congrats Daisy! If you could just email me your address I will send you your prize. Hello & welcome! 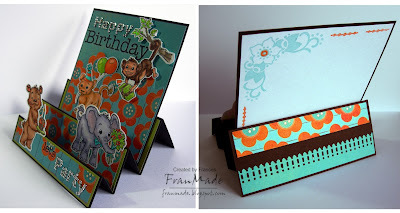 Hopefully you have come from Camilla's (and I'm sure it was a stunner :)), on your WoJ Anniversary Blog Hop in which case come in and have a nosey! If not, but you'd like to join in the hop then please start over on Katharinas blog first. 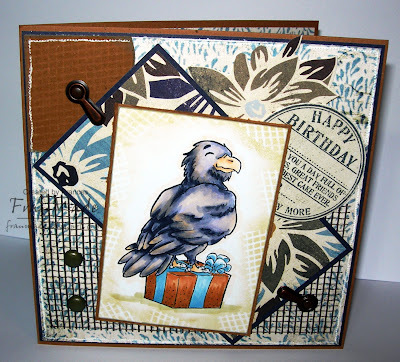 We're celebrating the first birthday of WoJ the same way it started . . yes, it's a new stamp release by Alison Acton. 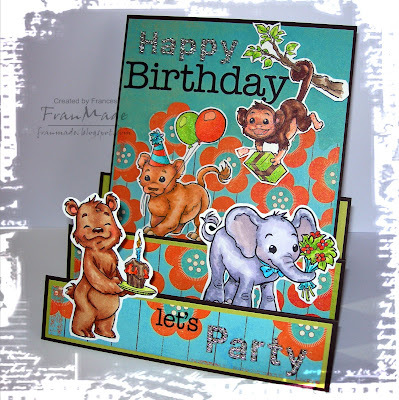 Collection of 9 party animal stamps, fab to combine (as I think you will see as you hop) and great fun. Hope you've enjoyed your little visit. 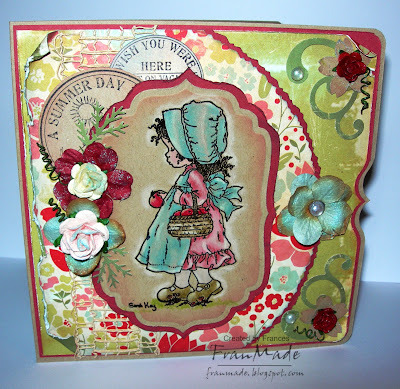 Now it's time to hop on over to Jacqui's blog, here to see what she has come up with. 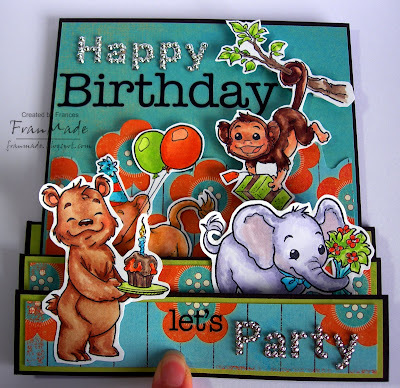 Images: WoJ stamps all cut out with white border to make them 'pop' against the background and monkey has been raised with foam pads. 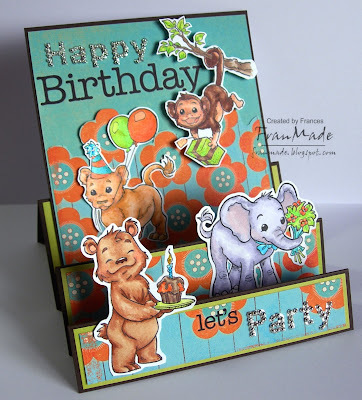 To get the party started, I will put all comments on this post tonight into a draw and winner will receive the cute monkey stamp, courtesy of Whiff of Joy, and mini stack of 6x6 papers from me (including the ones I've used on this card). CANDY CLOSED. See here for winner. 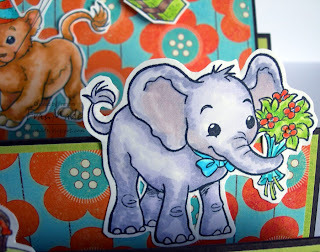 Hiya, no card yet but come back tonight at 7pm (GMT) for the Whiff of Joy blog hop/party. 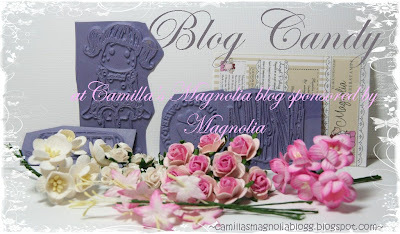 Another fabulous candy which I want (so don't enter o.k :D) is from Camilla who has just joined the Magnolia DT and has some fab stamps in her give away. So go drool over all her gorgeous creations and congratulate her whilst you're there! This one is open till Tue 28th. click on photos to take you to the relevant post. 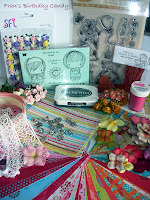 I saw I won last week's Fri sketchers prize from 'Ribbon Mad' so am hoping my lucky streak will continue! 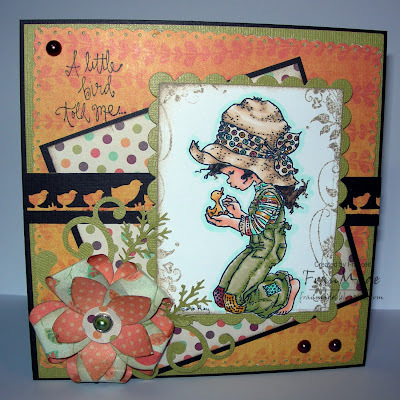 CCT this week wants to see eyelets on your card. I think that's something we all have stashed away somewhere but doesn't get used often . . so go dig them out girls! DP: Cosmo cricket 'little boys' got them in sale last year (glad I got 2 lots now ;)) and kraft bazzil card for matting. 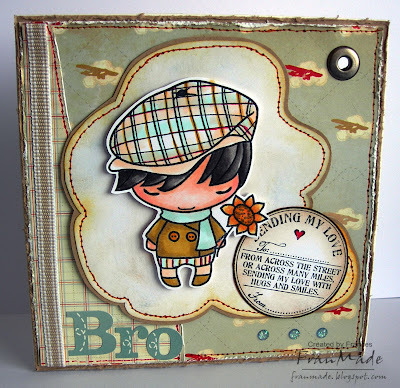 The 'bro' lettering are stickers from the pack too. I know, 3 posts in 1 day but this one should have gone up last night until AOL had other ideas! 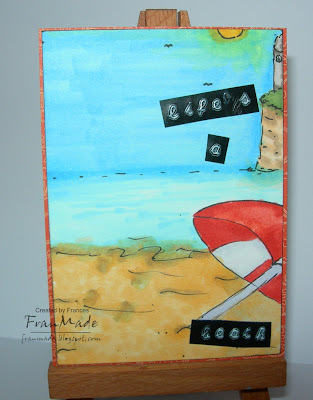 Wanted to play along to the Stampavie challenge #8 (as using Sarah Kay the other day has just made me want to go use more . . do you have phases like that?!) and I was hoping to use some of the new ones this week but my order's still not here (trust me to go pick the one store who hasn't had their stock in yet!). Never mind, perhaps it's a good thing really as it's made me go ink up what I do have! So looking at the ones uninked, I thought this one would fit the gardening theme. 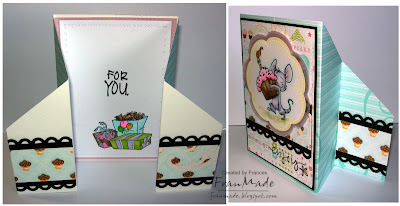 I've also used the fab sketch over on Friday sketchers and Spoonful this week wants to see swirls and I've got those on there too. O.K no more posts for today now, off to work (if you're looking for announcement of my candy winner it's in post below this one). And the winner . .
of this little lot, using random.org, is . . .
which, ignoring double post, I make to be . .
Congrats Andrea! If you could just email me your snail mail I'll pop it in the post to you. Thank you for all the entries, couldn't believe how many there were . . where'd you all come from, LOL?!! Extra thanks for those who liked what they saw and are now followers (but really, you didn't have to if it was just the candy you wanted! So feel free to unfollow, I'm a big girl and can take it!) If you weren't lucky, never mind I'm sure there's plenty more candy out there for you to try your luck and I'll be having another mini WoJ candy soon, so watch out for that one! Do you like my attempt at wet footprints in the sand?!!! 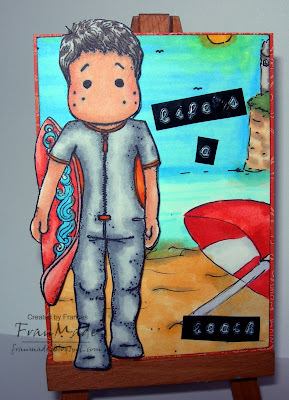 :) All coloured with Copics and the sentiment typed out with my ATB tapewriter. That's all for now. Will be back in a bit with my Candy winner and a card which was supposed to have gone up yesterday! 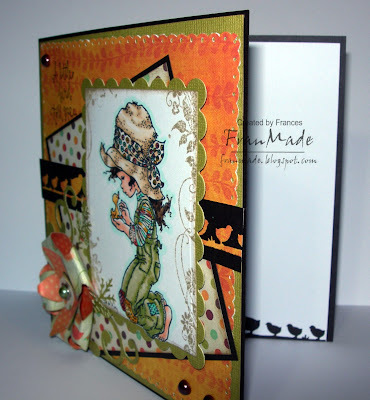 Hello, my card today is for the WoJ Challenge - 'piercing/paper pricking'. 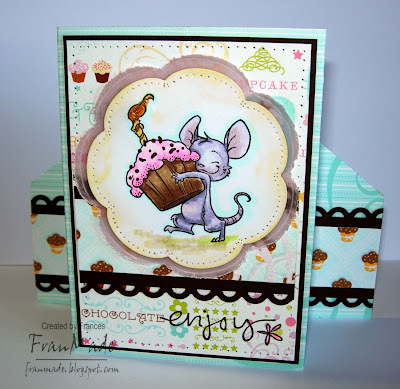 So after writing up the news about the WoJ blog hop (will come to that later) I just had to dig out cute Henry mouse again for my card. 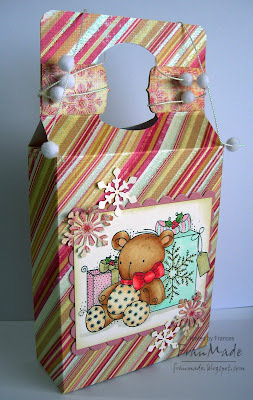 I saw this stand up fold card during my travels which I just had to try (sorry, can't remember who's blog now but they did point me to SCS here, which is where I got the measurements from). I really love how this looks and will definitely be doing more as it's so easy but I'll use double sided cardstock next time (instead of just using up some scraps on my desk!). Papers: DCWV ('sweet') offcuts & scraps that have been sitting on my desk for months waiting for the right image! Right, onto the WoJ news. 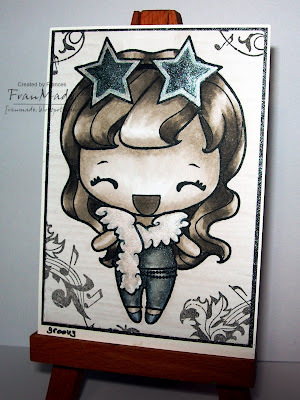 Just a reminder that it's the birthday blog hop this coming Saturday. 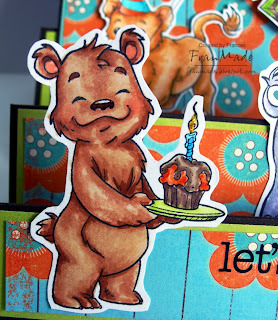 Yup, to celebrate WoJ's first birthday and also new release of stamps that night, we're having a party . .
Blog hop will start over on Katharina's WoJ blog and end over on Papercraft Planet forum for party chit chat and lots more. I'm afraid I'll be working that evening but I will be there in spirit as I'll pre-schedule my bloghop post! For full details see PDF poster here . WoJ: piece of cake . .
T&F ATC: 'American as apple pie'!